I will review the Insulinx Glucose Meter as soon as available. 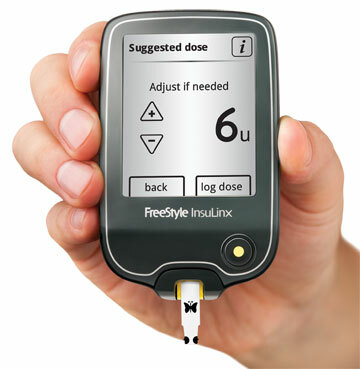 Alameda, California — Abbott (NYSE: ABT) today announced that it has received U.S. Food and Drug Administration (FDA) clearance for the FreeStyle InsuLinx Blood Glucose Monitoring System,[i] the first from Abbott to include a touch-screen interface, automated logbook and several personalization features designed to improve the diabetes management experience for patients. This unique device is also equipped with built-in FreeStyle Auto-Assist software that enables patients to track progress, analyze trends and easily display data for their health care providers. The FreeStyle InsuLinx System will be available to U.S. consumers within the coming months. The new FreeStyle InsuLinx blood glucose monitor includes an automated logbook, easy-to-use touch screen and personalization features. "The new FreeStyle InsuLinx System represents Abbott’s latest advancement in delivering innovative products for people with diabetes who use insulin," said Heather L. Mason, senior vice president, Abbott Diabetes Care. "The improved functionality, data sharing tools and personalization features are designed to improve the diabetes management experience for patients. We are excited to make this product available to diabetes patients in the United States." Abbott Diabetes Care, based in Alameda, California, is a leader in developing, manufacturing and marketing glucose monitoring systems designed to help people better manage their diabetes. Additional information about Abbott Diabetes Care may be found at www.abbottdiabetescare.com. Abbott (NYSE: ABT) is a global, broad-based health care company devoted to the discovery, development, manufacture and marketing of pharmaceuticals and medical products, including nutritionally, devices and diagnostics. The company employs approximately 91,000 people and markets its products in more than 130 countries. [i] FreeStyle and related brand marks are trademarks of Abbott Diabetes Care Inc. in various jurisdictions. A candid interview with Chef Jen, a contestent from the new Food Network show, Fat Chef. Weight Tips to overcome the top five obstacles that prevent weight loss success. October 2011: Are You Protein Deficient? How to avoid common problems of popular diet plans.